Product description: Class 2` Environmental Studies For Smarter Life-2 is written by Mtg editorial board and published by Mtg learning media pvt ltd. Buy Class 2` Environmental Studies For Smarter Life-2 by Mtg editorial board from markmybook.com. An online bokstore for all kind of fiction, non fiction books and novels of English, Hindi & other Indian Languages. 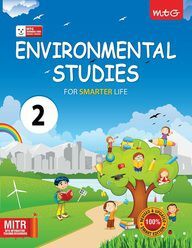 Environmental Studies for Smarter Life is a series of books for class 1 to 5. Stirctly following the NCERT syllabus these books are a source of encouragement and motivation for the young learners. This series is created by In-house MTG editorial board with some of the best teachers, renowned faculty and gold medallists, who have years of expertise and acumen in their fields of subjects, to prepare practice exercises for the young learners. 1. Age appropriate, child friendly, simple language accompanied with attractive illustrations. 5. Fun time and Project Time to help all three (auditory, visual and kinaesthetic) learners.